In retrospect, the first game in the Wonder Boy series is quite the anomaly. Not a single of its sequels bothered to repeat the caveman side-scrolling action design to a T, unless you count the oddball arcade release of Wonder Boy III that failed at merging mechanics and genres. Instead, its successors forged their own path with medieval fantasy elements, making the parent game a near-forgotten relic of the franchise, whose template only survived through its spiritual "spin-off," the Adventure Island titles. It wasn't until 30 years later that a dev team released a game within the series that tackled the original's blueprint in the appropriately titled Wonder Boy Returns. To the dev's credit, they succeeded in replicating the design and feel of the first game without bastardizing it. Not much has been changed from the original template. You must traverse forests, through caves, across islands, and other environments to rescue the protagonist's girlfriend, Tina, and do so while a timer bar dissolves at an alarming rate. You can temporarily refill the bar by collecting various foods that literally appear out of thin air within each round, but you must do this while facing opposition. Along the way, you'll encounter an army of snails, hornets, bats, octopuses, and blue flaming skulls, which are highly dangerous when you consider a simple touch kills your protagonist. Guess what? You start out with no method of attack. However, finding an egg will grant you an axe projectile weapon. You can also find other items in eggs, ranging from a skateboard and brief invincibility, to a poison mushroom and a mini-reaper that quickly drains the timer. So yeah, Wonder Boy Prime. If you've never played the first Wonder Boy, all these descriptions make it and Returns'structures sound like very traditional side-scrolling romps; in several ways that are already apparent, from said enemies, rounds that build up to a boss battle, and one-hit kills, this is true, but in other instances no. The rapid dwindle of the timer, combined with the constant need to collect food along the way in the midst of danger, already adds an element of tension. But then you insert tricky enemy and hazard placements, and both games become more like endurance battles. Returns and its predecessor are platformers in the sense that they force you into handling specific situations with skillful reactions. For instance, you'll need to jump on several clouds during the island rounds, some of which are stationary, others that move in a pattern, and then there are those that plummet when you make contact. There's no visual difference between the three. While most are obvious in spite of this obstacle, it is still up to you to discern and react accordingly if you don't want to die a bunch; time jumps, be patient, and use hand-eye coordination to survive. For another example, anything you habitually jump over or towards in the game can be a threat, as the devs might place an enemy within that situation that you must counter immediately. Suffice it to say, you learn a lot through death. Good thing there's checkpoints. Not surprisingly, that's also one of the bigger issues with these two games. You're encouraged to make thoughtful plays to survive, but half the time, the whole "learn through failure" aspect almost feels like a sabotage of that play style. Though, this is more because of the way it's executed: several of these deaths are unavoidable without foresight. Enemies literally just come out of nowhere in a way where you can't react in time. Where's the skill in that? This doesn't occur as much in Returns, not to mention the difficulty structure has been modified a bit; you're no longer required to finish the journey in one go, as your progress is saved and can be resumed from a round select menu. And if you want to tone down or crank up the difficulty with lives, hazard placement, and number of enemies, there's an easy and hard mode. There are other additions, too. New environments and enemies accompany the old guard, such as sliding penguins in snowy forests and magma projectiles within volcanic surroundings. Through progress, you'll also have a chance to play two extra characters: the kidnapped girlfriend and the 1986 version of the protagonist. Though, the most noteworthy modification goes to the bosses. Boss fights feel more like an afterthought in the original, especially since they're just swapped heads over the same body, but Returns actually offers variety. 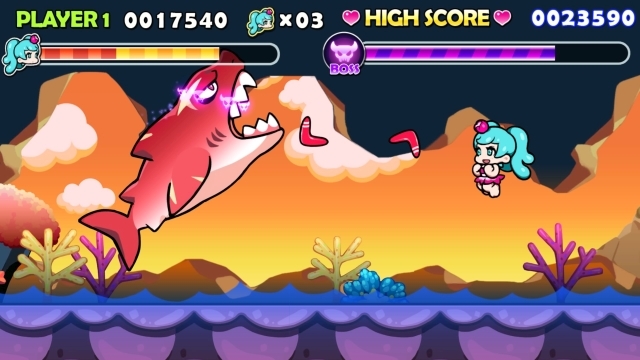 In one encounter, you'll battle an octopus queen who engulfs the screen, and in another, you'll dodge a devious shark lunging from the water. Unfortunately, a downside to the original fights, being able to defeat bosses quickly, makes a return if you play anything below hard mode. There's also a challenge mode... but it's just the normal mode with the task of having to beat the whole game with two lives; you get a trophy for failing. While these additions bring diversity to Returns, most of the new content doesn't drastically change or improve on the template in any great way. This leaves the difficulty adjustments, in terms of gameplay, the only true notable change. So if you're coming in fresh to the play style of the original, this could potentially be an issue since you'll be going through 40 rounds that'll start feeling "samey" by the halfway point, even with placement trickery. This case of repetition is slightly curbed due to the new saving system if you're not one to complete games in a single sitting. However, if you've played the original and just want a similar experience, this game delivers. Wonder Boy Returns may not be great, simply delivering a straightforward action-platformer with a lot of repeating structures, but it does so while staying true to the spirit of the first. 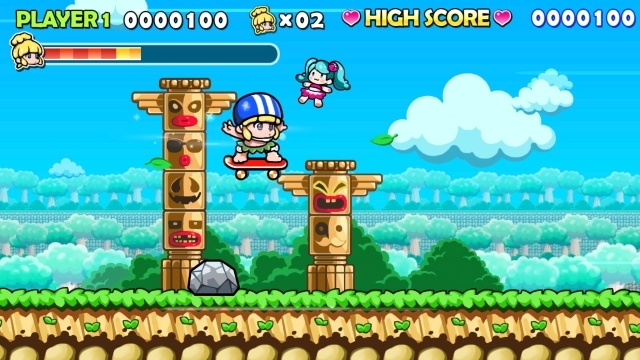 If you enjoyed this Wonder Boy Returns review, you're encouraged to discuss it with the author and with other members of the site's community. If you don't already have an HonestGamers account, you can sign up for one in a snap. Thank you for reading! There should be a warning on these types of games, somewhere; "Dangerously Cute!" I thought at first this was handled by LizardCube, but apparently not, as CFK CO. Ltd was responsible. As I understand it LizardCube is working on another of the Wonder Boy games, so we've more to look forward to from them. This was a good review, and I could see myself picking it up for the Switch at some point. One nitpick though, in this sentence, "sense that they gauge you into handling" are you sure gauge is the correct word for that? Having played the original rather a bit I know what you're describing - almost pigeonholing the player into a specific set of timed button presses. As always though, a pleasurable read. I must've been thinking of another word when I used that. I changed it to something much easier to understand. Thanks for pointing it out! Glad you enjoyed reading it, too. You know the funny part? As I was writing this post, I just realized I planned on reviewing this game two years ago on this same month. My original plan was to do this first, then do a Wonder Boy III Genesis review, and then a Wonder Boy III remake review. Well... I finally got around to it! Good review that pretty much echoes my thoughts on the game, although I think you liked it a bit more than I did. I felt the controls were a bit slippery and while I appreciate that there were proper bosses this time, I still didn't like them. I don't know if you've had a chance to play it, but New Adventure Island for the Turbografx is a far better update to the formula than this is, and that came out in '92! Thanks for reading. Oddly, while I did notice the loose controls, I actually wasn't bothered that much by them. Maybe it was because I played the SMS Wonder Boy prior to WB Returns just for comparison, and I felt a little bit of slippery in that game, too. I've actually never played an Adventure Island game. Or at the very least, I never completed one, because I think I have a very faint memory of renting one of the NES titles way back. While I don't think I'll do it any time soon, I would like to play them, just to see the different path the series took from the first Wonder Boy game. Never seen the Wii game in motion... That's horrifying. Alas, pickhut, the game is no longer available to purchase. So you will never be able to play it unless you do like the guy who made that video did and emulate it. But me? I bought that puppy as part of my "Buy everything available digitally on Wii" spree a couple of years back, and that means I can play it to my heart's content and maybe even review it someday. Ha ha ha ha ha. Don't you feel silly now? Poor Pick! Poor me. Venter just stays winning. I now regret making FAST: Racing League my last WiiWare purchase. None of the material contained within this site may be reproduced in any conceivable fashion without permission from the author(s) of said material. This site is not sponsored or endorsed by Nintendo, Sega, Sony, Microsoft, or any other such party. Wonder Boy Returns is a registered trademark of its copyright holder. This site makes no claim to Wonder Boy Returns, its characters, screenshots, artwork, music, or any intellectual property contained within. Opinions expressed on this site do not necessarily represent the opinion of site staff or sponsors. Staff and freelance reviews are typically written based on time spent with a retail review copy or review key for the game that is provided by its publisher.